This short book is packed with wisdom, humor and wit. Andy Andrews is an excellent communicator, and he brings those skills to this book about subtle differences that can be harnessed by individuals, teams, and corporations to separate themselves dramatically from their industries’ averages. He writes that nothing excites him more than a focused search for little things that make big differences. In this book, he shares stories that not only make a point but have a purpose beyond the point. The book covers a wide range of thoughts, including chapters that will bring peace to your family, and some, when you harness what they teach, can make you a lot of money or turn your team into a winner. He writes that in order to change your life, all you need is one idea. ‏‏One idea will change everything. One idea will change the world. He writes that if we are to become extraordinary achievers, we must learn to recognize the little things that actually create the gap—and, consequently, the difference in opportunities—between one and two. The difference really is in little things because the actual gap between first and second place is most often ridiculously small. He asks what are the “things” that create the life of our dreams, and states that it is really the small stuff. Small, strategic moves in the beginning of any endeavor yield massive growth down the road. ‏‏He tells us that most people live their entire lives without ever thinking beyond what they have come to believe is true. But it is a valuable person who manages to see a new way of thinking as an opportunity. He encourages us to not always believe everything we think. To do so will be the end of any exponential growth you might have experienced in your life. To begin to compete at a different level, he encourages us to examine our thinking, especially about how things are done in our industry—and realizing we can’t always believe everything we think. ‏‏He returns to the concept of perspective, one he has written about extensively in the past. He tells us that it is critical that we understand the difference between perception (how a situation is perceived) and perspective (what one decides what the facts of that moment mean in terms of direction toward one’s ultimate desired destination). He tells us that average people compare themselves to other people, while extraordinary achievers do not compare themselves to other people. Instead, they compare themselves to their own potential. ‏‏He tells us that if we want to be an extraordinary achiever, then we really do want to be different. Change Ingredient #1: What’s in it for me? Change Ingredient #2: Proof beyond a reasonable doubt. He tells us that if you understand the myths and the elements of change, you can respond to it with confidence and creativity and even joy. And we can help others respond positively as well. ‏‏He writes that a person cannot achieve beyond what they really believe to be the truth about themselves. ‏‏What a person really believes is so powerful that their belief actually controls their behavior. He tells us that we should spend less time setting goals to satisfy the expectations of other people and use more time to concentrate fully upon legitimately increasing the level of what we really and truly believe is possible. And he tells us that this can only be done by aligning ourselves on a course to pursue the life that God has identified for us as the very best. The book covers a wide range of thoughts, some of which could be expanded into an entire book on their own. The book concludes with a helpful Reader’s Guide, with questions that will be helpful whether reading the book together or in a book club with others. This is a repackaged version of Andrews’ 2008 book Mastering the Seven Decisions. The material is similar to what he spoke on at the organization I work at in early March. 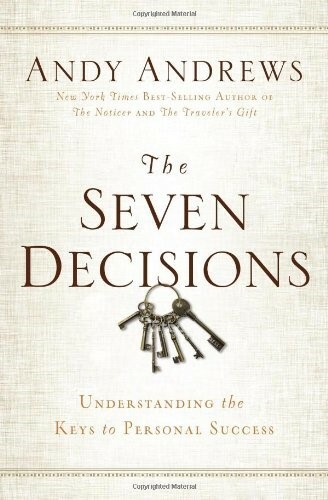 The seven decisions are those that were originally introduced in his best-selling book The Traveler’s Gift. I listened to the audiobook version, which was well read by Andrews. Andrews tells the reader that years ago he read more than 200 biographies. From there, he came up with 7 decisions or principles that when applied consistently lead to extraordinary lives. For this book, he wrote to leaders in all fields asking for lessons from them. He excerpted the best lessons for each decision and included them in the book. He includes letters from Jimmy Dean, Bob Hope, General Norman Schwarzkopf and Amy Grant among others. Andrews introduced the seven decisions in The Traveler’s Gift and goes much deeper with them in this book. He states that reading The Traveler’s Gift is not a requirement for reading this book. Each chapter corresponds to one of the seven decisions from The Traveler’s Gift. The book also includes helpful exercises to allow the reader to interact with each decision and to see the connection of each with their own lives. Taking consistent action is crucial to the realization of a successful life. Leadership is simply relating your beliefs or opinions to others with conviction and then sticking to that conviction even in the face of criticism or dissent. If we don’t accept responsibility for where we are right now, we have no hope of changing our future. You are where you are because of how you think. Your life should not be an apology; it should be a statement-an extraordinary demonstration of the possibilities within all of us. Adversity prepares you for greatness. Challenges are gifts. Be on the lookout for something that will change everything. A wise man will cultivate a servant’s spirit, for that particular attribute attracts people like no other. The bold capture our hearts and souls because they have followed their hearts to become who they are, providing a shining path for us to follow. Changing the world begins with a single act. Successful people make their decisions quickly and change their minds slowly. 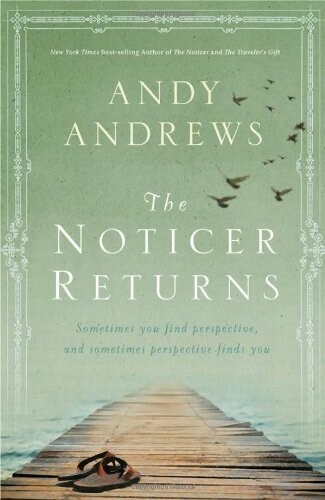 The Noticer Returns: Sometimes You Find Perspective, and Sometimes Perspective Finds You by Andy Andrews. Thomas Nelson. 240 pages. 2013. We are introduced to several people in the book whose lives intersect thanks to Jones and his parenting class. Jones gives them perspective on their struggles and dreams. Jones even gives perspective to Andrews who is facing writer’s block and stressing about his publisher’s deadline for his next book. Jones shows how our lives can improve by changing the way we think. Andrews weaves in wisdom into an interesting story. Below are short passages or quotes that I highlighted when reading the book and wanted to share with you. “Son, you are at this very moment in the biggest war you will ever wage in your life. It is confusing, but you’re fighting for what you’ll one day become. There are forces clashing for space in your head that you don’t recognize, can’t see, and won’t understand until you’re able to look back on the whole thing years from now. In a way, Jones knew, every journey started in the dark. And that, of course, was the very essence of his reason for being. It was his purpose. Jones took folks by the hand and helped them see the pathway by which they could move into the light. Perspective, he called it. Jones looked at the younger man thoughtfully. “I guess you could say that I’m in the transportation business, son. I help folks get from where they are . . . to where they want to be. “If your thinking is causing you to do what everyone else is doing, you are only contributing to the average. Even if you are contributing to the average at a high level, it is still . . . average. “Now,” Jones said, scooting closer to us, “while morality is not doing what is wrong, character is actively doing what is right. “This, of course, leads us to the logical conclusion that a person without morals cannot be a person of character. “Most parents try to impress upon their children that where they end up in life has something to do with the decisions they make. “What a person thinks is absolutely and always determined by how a person thinks. An extraordinary life is a destination. In order for you to arrive at that chosen destination at some point in the future, it is critical that you choose the correct pathway to begin that journey. There are many pathways from which to choose, but only one pathway will lead to the destination you desire. But the highest value—the most important value—is the value you create with your life and how you use it for others. “Baker, the man you become will be determined by the value you provide for others—those whom you meet on the road to who you are becoming. Great or small, your legacy will be judged one day by the quality and amount of value you were able to contribute in the lives of other people. “The bottom line on the declaration, ‘This is part of our culture,’ is this: At its best, this is a choice made with little or no critical thinking about future results. At its worst, it is merely an excuse to do what one wants to do. It is selfish, leaderless, pack behavior with unconsidered consequences that ultimately destroy families, neighborhoods, cities, and before you know it, generations. A culture is chosen by its people, either by deliberate decisions or acquiescence to how everyone feels at the time. “The culture you live in today is the culture you have allowed. That is true of your family, and it is true of your country. “Learning’s purest form,” Jones replied, “is realized by the individual who continues a quest beyond the classroom, fueled by a passion to discern wisdom. Wisdom—genuine truth—holds the key to refining one’s thinking. “The way a person thinks,” he began, “is the key to everything that follows good or bad, success or failure. A person’s thinking—the way he thinks—is the foundational structure upon which a life is built. Thinking guides decisions. Thinking—how a person thinks—determines every choice. I recently read The Traveler’s Gift by Andy Andrews. 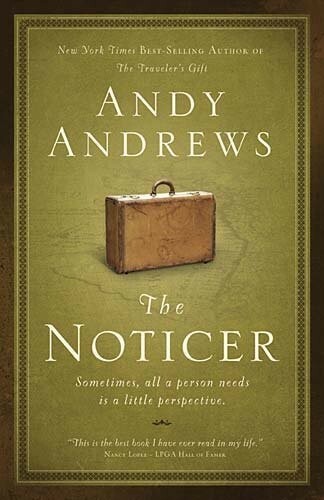 A recommendation from a few friends was that I follow that up by reading Andrew’s book The Noticer. I’m glad I did. I enjoyed The Noticer much more than I did The Traveler’s Gift. I listened to the audiobook version of the book, which was narrated well by Andrews. The book is written as a parable or allegory, with some of it autobiographical, with Andrews beginning by telling a bit of his own story. He tells how he came from nothing, and how with a bit of perspective, he grew to become successful. When Andy was at his worst, his parents having died, and living under a pier in Gulf State Park, a mysterious white haired man carrying a suitcase named Jones (“no Mr., just Jones”) shows up. Jones seems to know a lot about Andy. Jones teaches Andy that perspective can get him through the challenges of his life. He leaves shortly after imparting that wisdom, but not before giving him a few books to read. The books were biographies of successful people who came from nothing. Andy reads those books, and many more (he later states that he read more than 200 books), and begins to turn his life around. The story picks up years later and Andy has become successful. He runs into Jones as he is helping another couple who are on the verge of divorce. We later see Jones bringing perspective to people who are going through a variety of crises in their lives – (suicide, bankruptcy, dishonesty in business, etc.). He always seems to show up when people need him the most. Jones is mysterious. Nobody knows where he lives, he never takes people up on their offers to spend the night at their home and he doesn’t even know when he was born. Who is this guy? He’s a noticer. That is his gift. He sees things in a broader way, and gives people perspective. I enjoyed how Andrews adapts Gary Chapman’s five love languages into four dialects. I also thought that the question “What is it about us that others would want to change?” was a great one. It’s time to stop letting your history control your destiny. People are either in a crisis, coming out of one, or headed for one. Worry is just imagination used in an unproductive way. Wisdom is the ability to see the future consequences of our choices. It takes wisdom to discern that oh-so-thin line between good and best. Many of life’s treasures remain hidden because we never search for them. If you are still here, then you have not completed your life’s purpose. Big stuff is made up of small stuff, so you better sweat the small stuff. We often judge ourselves by our intentions but others by their actions. If you want folks to believe in you, then it really helps if they like you. Life is a little like dessert. Keep your fork; the best is yet to come! In desperate times, much more than anything else folks need perspective. Think with me here … everybody wants to be on the mountaintop, but if you’ll remember, mountaintops are rocky and cold. There is no growth on the top of a mountain. Sure, the view is great, but what’s a view for? A view just gives us a glimpse of our next destination-our next target. But to hit that target, we must come off the mountain, go through the valley, and begin to climb the next slope. It is in the valley that we slog through the lush grass and rich soil, learning and becoming what enables us to summit life’s next peak. When you focus on the things you need, you’ll find those needs increasing. If you concentrate your thoughts on what you don’t have, you will soon be concentrating on other things that you had forgotten you don’t have-and feel worse! If you set your mind on loss, you are more likely to lose … But a grateful perspective brings happiness and abundance into a person’s life. A life filled with opportunities and encouragement finds more and more opportunities and encouragement, and success becomes inevitable. When doubts and fears assail us, we subconsciously calculate the possibilities. `This might really happen!’ we tell ourselves, or ‘What will happen if…?’ And soon, we are so paralyzed by the idea that disaster is imminent that we cannot function in our work-and even our relationships dissolve. We have imagined our way to self-destruction. And that’s what has happened to you, my friend. What you must do – to defeat bad logic with good – is to deflect your subconscious from calculating possibilities. Instead, direct your mind to calculate the odds. You can learn very quickly to calculate the odds of an event occurring and eliminate it as even a remote possibility in your life. One way to define wisdom is the ability to see, into the future, the consequences of your choices in the present. Your ‘big picture’ will never be a masterpiece if you ignore the tiny brushstrokes. Trust and respect are about the future. Forgiveness will be in the hands of others and can be given to you, but trust and respect are in your own hands … and must be earned. 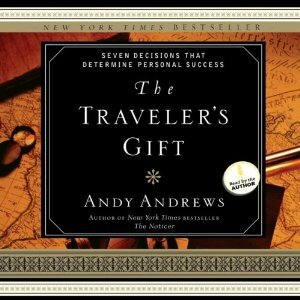 The Traveler’s Gift: Seven Decisions that Determine Personal Success by Andy Andrews. Thomas Nelson. 211 pages. 2002. Audiobook read by Andy Andrews. I first heard of Andy Andrews at a Leadercast learning event several years ago. Many of my friends have read his books and been impacted by them. On March 6, Andrews spoke at the organization that I work at. After seeing him speak I decided to read one of his books. A friend recommended that I start with The Traveler’s Gift. This book is one that many will be able to relate to, as we all face difficulties at times that can seem insurmountable. We meet David Ponder, a businessman, husband and father. Soon, he sees his life crashing down upon him. He loses his job and health insurance. His credit cards are maxed out and his daughter needs surgery. He feels like a failure and begins to think that his family would be better off without him. After getting fired, he takes a drive and spins out on an icy bridge, hitting a tree. David is challenged to use the information he has been given from these figures. Near the end of the book he gets to travel to the future as well. Andrews is a very good story-teller, and that is the strength of this book. It’s not a particularly well written book, but I listened to the audiobook version, which was well-read by Andrews, with him effectively handling the voices of the different figures that David encounters. I found this to be an inspirational, motivational and entertaining book that can give people who are going through difficult times hope for the future.